Latvia 5 euro 2016 "Janis Rozentals"
Obverse: The space imitating the back of the painting is divided into four fields. The top left bears facsimile signature of Janis Rozentāls, with the inscription "The Princess and the Monkey", measurements "147,5 × 71" and the year 1913 beneath it in an enclosed field; the words "canvas, oil" are placed to the right. The two lower fields carry a vertical inscription "5 euro" (on the left) and the seal of the Latvian National Museum of Art (centred and on the right) bearing the inscription LATVIJAS REPUBLIKA and the year 2016. 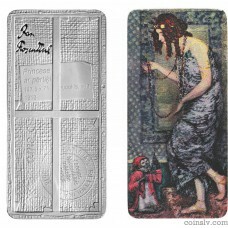 Reverse: The reverse shows a reproduction of Janis Rozentāls painting "The Princess and the Monkey" (1913). In the painting, a lavishly dressed young woman and a monkey hanging on to her string of beads are outlined on an ornamental background.